Here is a small toot on the trumpets of the small, the beautiful, the quiet, the independent, the meaningful, the contemplative and the insurrectionary acts, ways, work of all those whose work or presence is not otherwise big enough to be seen or heard in a world which marches to the great fanfare of the marketing department’s drum. When the conditions are right. 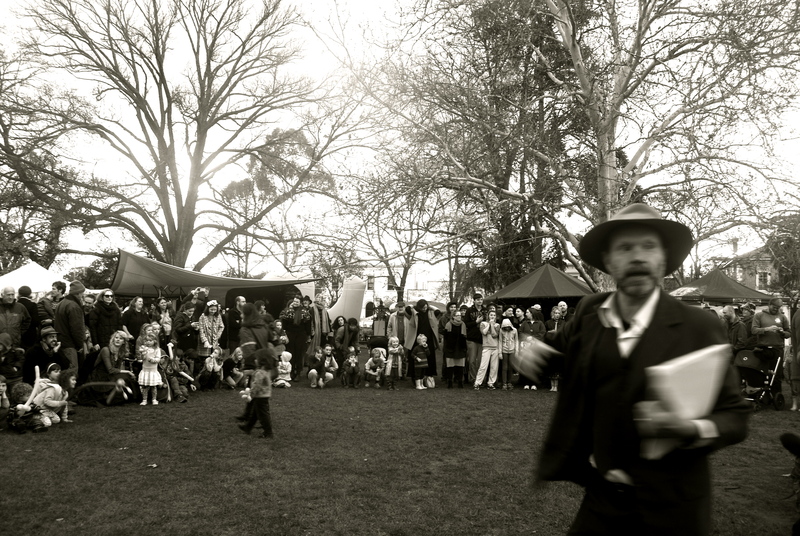 The Castlemaine Village Winter festival; an inside story. In a world where the largest corporation, largest funded arts body, largest sales- making book, largest anything with financial backing seem to either absorb, consume or overtake the small, low or unfunded art project, voice or initiative, The Village Winter festival stands rather precariously and interestingly in the firing line of this battle front. The Village Festival, like the literary novel, or the independent theatre company, or the next young band with a new sound, has struck out to create something original, something with artistic integrity. To do this it competes against large well-funded bodies, festivals and companies who have staff, marketing departments, budgets and campaigns, and who have as their primary motivation, the requirement to please the customer. A very different objective. The rise to prominence of the “marketing department” has come hand in hand with the new status of the consumer and the resultant power of the customer. It begs the question of whether art is still made for art’s sake or for the customer’s sake? The very same customer who mindlessly consumes a screen-fed diet of repetitively mind numbing ( at the least) entertainment, now seems to be the customer whose needs culture must supply and for whom most of it is dumbed down. Generations ago, for instance, there were plenty of very fine books for children, now there appears to be only one book and it is a series. It repeats. It’s the same. And so culture is increasingly homogenised. Everything becomes another version of the same. Which brings me back to the Village. The Village is a small independent traveling arts festival that is run by Suzannah Kalk and Stuart Varkass, with a small team, ( their twelve year old son Jip is a member of the sound and light crew), very little funding, no marketing budget, and no production managers… And no one to answer to. Because of this they remain independent. They don’t have to be either tasteful or commercial or popular. There are no customers to please. Instead they create an art event whose aesthetic is unpredictable and whose invention is mothered by necessity and goodwill. An exhausting but rewarding act of optimism every time. But because of this there is a poetic and strange, haphazard, homemade warmth to it that a well-funded highly- organised festival can’t ever approximate or even pay for. The enormous challenges of putting on a festival without funding reveal diverging attitudes to art, money and community. The Village pays all its artists and performers, whether experienced, famous or brand new, the same fee of $50 and dinner and a drink. As such it offers a platform and experience for young, new, local or aspiring artists. While some experienced artists wont or can’t work for so little others choose to do it because they are willing to support an art event that in turn supports emerging artists, artistic experimentation and endeavour and community engagement with the arts. Because many of the artists are gifting their time and experience, there is an atmosphere of the new and the old and indeed of the pure love of it. A mish- mash of experience and freshness, of innovation, experimentation and ingenuity. Not everything is well rehearsed, polished or predictable. A lot of it is never before seen and never to be seen again. It is immediate and raw… An on-the- spot invention in response to an environment that is festive, open, temporary and most of all, inclusive. 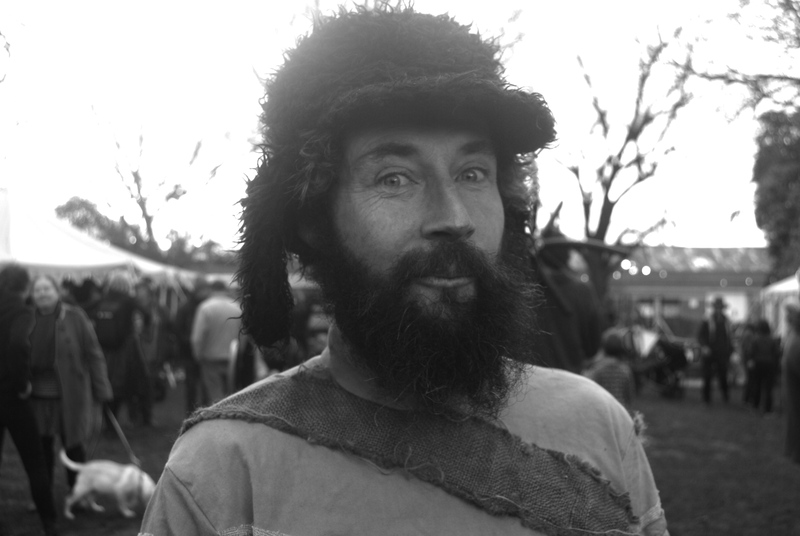 Anyone: artist, amateur, hobbyist, yo-yo enthusiast, dog lover, cook, choir member, dancer, teenage instramentalist, child fire twirler, is welcomed by the Village to join in the mayhem and become a vital part of the art of this event, the art being a quality of atmosphere that does eschew the rehearsed, the polished, the controlled, the expensive, the prestigious and instead offers a vital and unique democracy of possibility…. The Village pays its crew a wage. Unlike performing, setting up and packing down tents and stages is otherwise thankless labour. However working for the Village is like working within a family. Crew members sit down to together with the directors to home-made meals ( often cooked by neighbours and friends). They are found beds or couches or caravans to sleep. They often double as performers. They are not given job descriptions, they are trusted to take initiative. Where corporations and large festivals create employees and customers, the Village creates community. The Village makes of its attendants, a participant, a performer, a co creator. 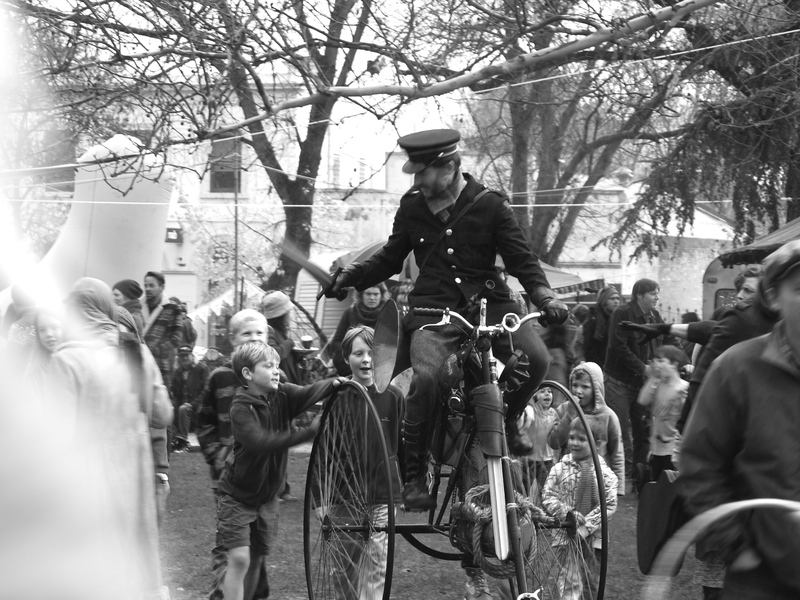 This year was the second year for the Castlemaine Winter Village festival. The festival received from Mt Alexander Council $3800 towards the staging of it. As it was impossible to even pay the crew required to install the tents, lights, stages, sound etc. (let alone artists or the Village itself) the only way to make the festival happen was to join forces with other underfunded arts projects and to charge an entry fee. It was decided that the fee would be $10 with children free. While many customers felt they shouldn’t have to pay at all, there were many “community” members who wanted to donate more. An interesting divide in attitude. Similarly, two weeks before it was to happen, about 9 of the artists, the bar manager, a photographer and a pig withdrew, many of whom had good reasons, some for instance had been offered proper pay cheques at funded festivals, (who can blame them?) Perhaps the most lamentable cancellation came from the pig, who did not have a better-paid gig, and around whom the event of the marathon reading of Charlotte’s web had been planned. The pig withdrew on the day of the Winter festival because its keeper felt it was too cold. In contrast, there were people who just willingly and spiritedly jumped on board, who gave their time freely, who volunteered with activities as various as organising to glean fallen apples, juice them, and stand there day and night selling warm spiced apple juice or making electronic installations on stray thoughts in caravans, or sitting on the box office, or scaling trees to install lights, or making pots of soup behind scenes to feed the crew and artists, or roasting chestnuts, shucking coconuts, washing dishes, decorating caravan interiors, weaving webs for pigs who never showed…. And all the artists who did perform didn’t do it for the money, yet they still spent hours making shadow puppets, creating stories, masks, costumes, songs…. Perhaps even the suite of cancellations and all the ensuing madness this created in a whirlwind last two weeks of preparations, added something to the final result of madcap and impromptu make-do. The community’s willingness to help, to accept imperfections, to participate, to be bothered and to come is what gives the Village its drive and life blood, not only because it’s heart warming, but because it shows that people do still value something that is small and teetering and connected at a grass roots level to a community rather than to a customer. Who knew what the alchemy would be for a dusk parade opened by an anarchic general on a steam-punk, horn- honking penny farthing, a young boy twirling fire, a white and ghostly specter of a large-headed winter king wielding a torch of fire, a crew of children trailing him, singing a locally-penned winter song, a choir trailing them, building the song and then two newly initiated pyrotechnic lads lurking at the hearth? Needless to say, it went off with an appropriately insurgent bang. 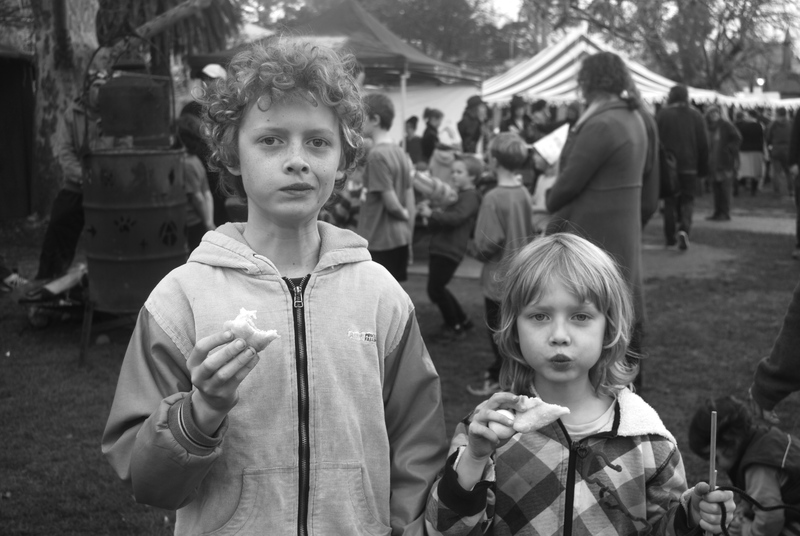 The Castlemaine State Festival employs on a full time salary for two years one director to create one festival in these two years. 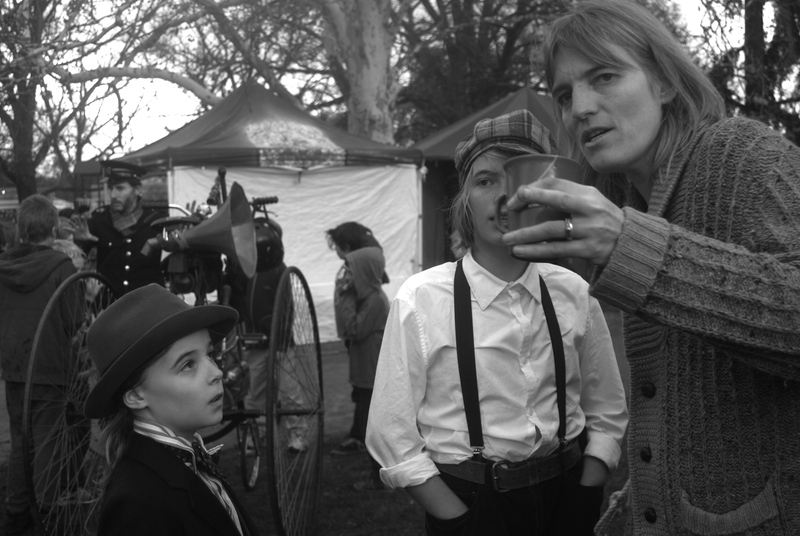 Whatever the artistic merit of the State Festival is, and without wanting to undervalue the role it plays, the place it has and the work the director does, it is perhaps still worth asking, should it be monopolising arts funding in Castlemaine for both years? Which leads me back to the original conundrum of the Large swallowing up the Small….